Chest pains can happen unexpectedly, at any time. You may try to ignore them, but if they have you alarmed, you may want to investigate further or seek medical attention. Chest pains are one of the more common reasons that people phone for emergency help. Each year, doctors in emergency rooms diagnose and treat millions of individuals for these pains. Luckily, the pain does not necessarily equate with a heart attack. It can be unrelated to any heart problem at all, in fact. However, if the chest pains you are experiencing are unrelated to the heart or cardiovascular system, it may still be important- important enough to go to the emergency room for an evaluation by a doctor. The mistake many people make, particularly men, is to just ignore the symptoms or hope they will go away. Ignorance is not bliss when it comes to medical problems. If you do have a problem, ignoring it will not make it go away. In fact, avoiding a trip to the doctor can come at much higher cost down the road. It can come in the form of high doctor's bills, unnecessary hospitalization, or in some cases, death or disability due to an actual heart attack. Chest pain causes and symptoms can be as varied as the patients themselves. Quite often, the underlying cause may have nothing at all to do with your heart. However, there is no real way to know without seeing a doctor. Normally, pain associated with a heart attackpresents with some of the following symptoms: Tightness in your chest, pain, or pressure; a searing or crushing pain radiating to your neck, jaw, back, shoulders and arms, especially the left arm; pain lasting for several minutes which goes away, only to return more intensely; shortness of breath, dizziness or nausea, or sweating. 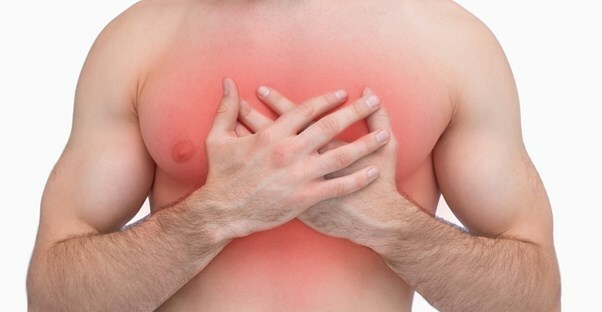 Chest pain causes that are unrelated to heart problems can be numerous. Symptoms in this category include: a burning sensation beneath your breastbone or sternum; a sour feel in the mouth or the feeling of food coming back into your mouth; difficulty swallowing; intensifying pain when breathing deeply or coughing; pain which either grows or reduces when changing body positions; tenderness when your chest is pushed. If the symptoms of your chest pains are consistent with a heart attack, seek medical attention immediately. Failing to to see a doctor promptly during a heart attack is associated with a higher risk of mortality. Chest pain causes will determine the course of treatment for chest pains, if any. For example, if the cause of the chest pains is determined to be angina, the doctor may prescribe cholesterol-lowering medication. Angina is chest pain caused by a restricted blood flow to the heart. Over time, cholesterol plaque can build up on the walls of the arteries which transport blood to your heart. They can narrow the arteries and temporarily limit the blood supply of the heart, especially during heavy physical exertion. If one of the chest pain causes is related to a condition called pericarditis, inflammation of the heart due to a viral infection, a course of antiviral drugs may be prescribed. Myocarditis is another type of inflammation of the heart which is often caused by a viral infection. One cause which is unrelated to the heart is heartburn, in spite of its name. One of the other possible chest pain causes is gallbladder or pancreatic problems. These painful inflammatory conditions can cause intense abdominal pain which radiates out to your chest, even resembling a heart attack.